Ham and Cheese Empanadas - CRAZY good! Pie crust filled with a yummy ham and cheese filling and baked. Great for watching football and parties. Can make ahead of time and freezer for later. Ham, cheddar cheese, swiss cheese, cream cheese, dijon, Worcestershire, brown sugar, onion, pie crust. These things fly off the plate! SO good!! 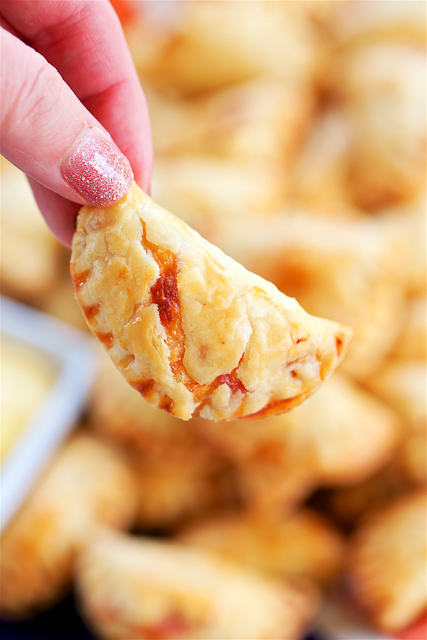 LOVE these savory hand pies!! Happy Festivus! I hope everyone has their pole and is ready for the Airing of Grievances and Feats of Strength later tonight. We are ready! 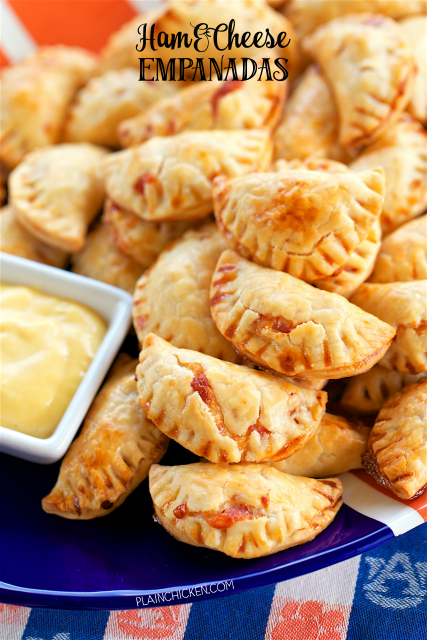 We are also celebrating with these yummy Ham and Cheese Empanadas. Little pies stuffed with an amazing ham and cheese mixture. This recipe will make 48 empanadas. This recipe is perfect for a crowd! They are never any leftovers! You can make the filling ahead of time and fill the pie crust when you are ready to bake them. You could even stuff the pie crust and freeze the empanadas unbaked or baked. I love make ahead recipes! These are a great way to use up any leftover holiday ham!! They are perfect for watching all the championship games next week! I know we will having these at our watch party. SO good! In a large bowl, combine ham, cream cheese, cheddar cheese, swiss cheese, dijon mustard, Worcestershire sauce, brown sugar and onion powder. Set aside. Remove 1 pie crust from pouch; unroll on cutting board. With rolling pin, roll out crust to about a 16-inch diameter. Cut 12 rounds from pie crust with a 3-inch round cutter. Repeat with remaining pie crusts. Top each pie crust round with 1-2 teaspoons of ham mixture. Moisten edges of dough with water; fold dough over and press with fingers to seal. Use fork to create design around edge. I have got to make empanadas. Hope you have a great Christmas and New Year.